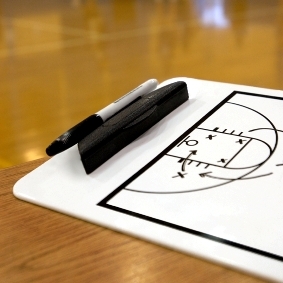 Check out these [tag]coaching tips for girls basketball[/tag] from Daryl and Ali. Two great suggestions that can work with all age groups. I guess my favorite [tag]coaching[/tag] tip, and I think my players would agree, is to make a challenge to the team. I coach middle school girls [tag]basketball[/tag] in Mount Hope West Virginia. The girls love to do basketball [tag]drills[/tag] when they know there is a big carrot at the end of the stick. I’ll make a challenge to them. If they hit 10 three pointers in 1 minute then I’ll do push-ups or run laps, but if they don’t get all the shots they have to do push-ups or run. We vary the shot type and number required, as well as the size of the carrot (reward). But the girls try so hard when they know they get to see me have to work. Probably over simplistic but for my girls and their age group it was great. Another tip that works well for them is to bring in another [tag]coach[/tag] for one [tag]practice[/tag]. Whether it’s the high school boys or girls coach or even the middle school boys coach. It helps when someone else comes in and repeats some of the same things you’ve been saying, and it’s even better when I get to learn something by watching them. We make our girls hang towels around their necks and hold on to both ends with their hands while we do our shell drill. This way they really work on using their feet and not their hands to play [tag]defense[/tag].